It’s been more than three years since NYC DOT announced its full implementation plan for the 14-mile Brooklyn Waterfront Greenway, a series of 23 capital projects that would build out the biking and walking path in high-quality, permanent materials. At the time, DOT said that construction would begin soon on the Flushing Avenue and West Street segments of the greenway, but with 2015 drawing to a close there’s still no sign of progress. What gives? Both segments have gone through the community board review process. The Brooklyn CB 1 transportation committee voted for the proposal for West Street in 2012, and in 2013 CB 2 voted in favor of the Flushing Avenue segment, which was supposed to reach the construction phase last fall. As is often the case with capital construction projects, however, the Department of Design and Construction hasn’t implemented the greenway segments according to schedule. DDC only furnished a vague progress report on the greenway projects, without a timetable, so we turned to Brooklyn Greenway Initiative co-founder Milton Puryear, who says that both the Flushing Avenue and West Street segments of the greenway are fully funded, designed, and ready to go. Puryear pins the delays on Flushing Avenue and West Street on subsurface infrastructure improvements that must precede greenway construction. The West Street portion, for instance, includes bioswales and high-level sewers that will prevent stormwater from overloading the sewage system and from mixing with raw sewage before it goes into the river. As the construction timetable drags on and the substantial planning work that went into the greenway recedes further into the past, it can seem like the project’s momentum is slipping. 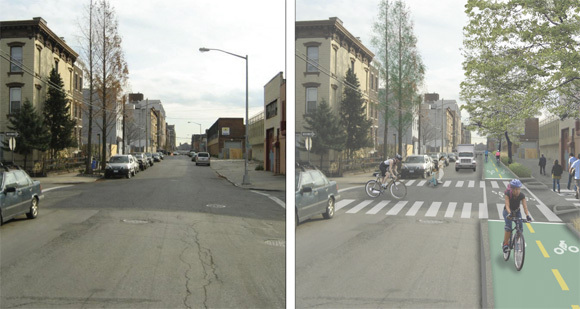 At a mid-November Community Board 1 meeting, for instance, Brian Coleman of the Greenpoint Manufacturing and Design Center complained about the effect of the West Street project on truck traffic, even though the greenway has been subject to extensive review in North Brooklyn. Puryear emphasized that the project has already gone through an eight-year public planning process involving hundreds of people. To delay it now would be “presumptuous and unfair to all who have put in the hard work to shape the plan over the years,” he said. The biggest portions of the greenway could be constructed in the next three to four years. In addition to the Flushing and West Street segments, Puryear said the DUMBO portion of the greenway is funded and waiting for DDC to pull the trigger. Southern segments of the greenway, down to Hamilton Avenue, could also break ground in 2016. Puryear believes a domino effect will lend momentum to the construction process. “I’ve always used it as a proposition that if we get enough of it on the map, the more the public will demand it get completed,” he said. Still, he keeps his hopes in check. With BGI co-founders Brian McCormick and Meg Fellerath, Puryear has been advocating for the greenway for nearly two decades. While progress has been substantial, with much of the greenway built out in interim phases, it has not been swift. “I thought 14 years ago that half of it would be built in five years,” he said. The Flushing part is too narrow and will be overcapacity from opening day (as the existing curbside lane is during morning rush when it’s warm). Why did they keep a Class 2 bike lane going in the other direction? Why do we need a huge painted buffer? So much wasted ROW width here. Flushing Ave is a truck route (sigh) that has to be able to accommodate the occasional wide load, probably the reason for the excessive painted buffer. The painted bike lane and non-AASHTO compliant sharrows though? I’m as dumbfounded as you are. the painted bike lane is because many cyclists keep going east on Flushing after the greenway turns north. So start a painted bike lane then. Taking this space away from the primary protected route is the saddest case of splitting the baby in half that I have seen. East of Vanderbilt the (present day) volumes are probably low enough for this width, but some future proofing would not be out of line considering that they will probably never come back to improve this within our lifetimes. What’s really needed are one-way protected bike lanes on both sides of the street. Two-way bike lanes do not meet best practice and, as you note, will be functionally obsolete as soon as it opens. I do appreciate the work of the BGI, but this is one consequence of calling something a “greenway” and not a simply a vital piece of transportation infrastructure. Why did they keep a Class 2 bike lane going in the other direction? To reduce conflict between motorists and cyclists who don’t feel like crossing to the other side of the street. Two way paths are a poor practice on a street grid but are fine along a natural boundary like the Navy Yard edge. I’d rather ride eastbound with 3 low volume (at least until the Wegmans goes in) or controlled crossings along the way rather than 10 higher volume intersections. This does introduce the question of whether queuing for turns will block the path (like it does on the stupidly narrow and extremely high volume Canal St path at the Manhattan Bridge entrance), which I don’t have an answer for. I doubt this path’s designers have an answer either. Are these conflicts common on West Street/12th Ave in Manhattan or at the location of any two-way bike path? The only reason I ride eastbound on the south side of Flushing today until there’s a break in traffic for me to cross is because it allows me to make a right off Vanderbilt (on red, admittedly) without having to stop, and because the existing bike lane makes it OK to. If the incentives were changed, I’d go straight to the two way path. Unless you always route yourself through all right turns like a garbage truck, you are going to have to cross a street eventually (statistically probably for half of your turns). The two way path actually keeps most people from having to cross Flushing at Navy, which is a fairly horrible left turn for cycling today. I assume the configuration is based upon having – in addition to the two way protected bike path and planted buffer – a parking lane, one lane of traffic in each direction and a left turn bay. The East-bound bike lane is likely thrown in when there is room (i.e, no left turn bay) and alternates with sharrows when there is a left turn bay and less room. Certainly a wider protected lane would be better, but running Flushing one-way to accommodate that was rejected and removing parking, as we know, is unthinkable. A two-way protected bike lane is taking shape on seven blocks of West Street in Greenpoint, one of 23 segments that will eventually comprise the Brooklyn Waterfront Greenway. Across the city, capital projects overseen by the Department of Design and Construction consistently miss one deadline after another. But DDC Commissioner Feniosky Peña-Mora has not articulated specific obstacles to timely construction or laid out a plan to reform current practice. 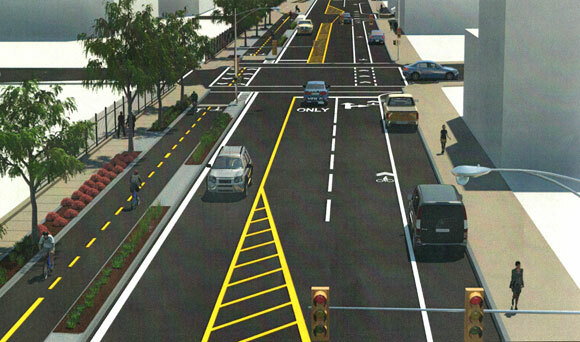 Construction on the two-way protected bikeway is underway, three years behind schedule.